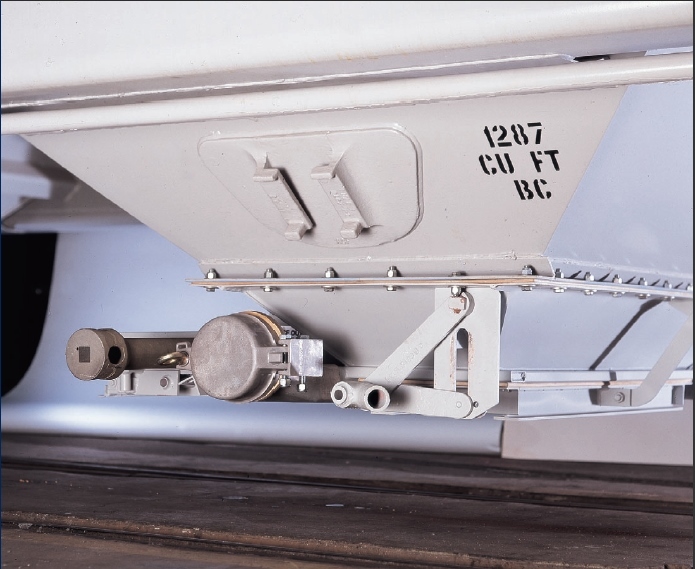 SMBC Rail hopper cars are configured with gravity, fluidized or pneumatic outlets to best suit your commodity. 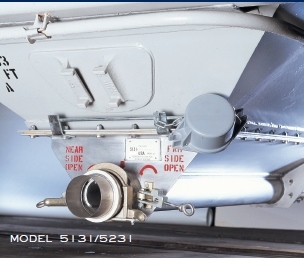 Adjustable Pneumatic Outlets 5135 & 5235 are designed to give you the utmost in operational efficiency. In addition to the operational benefits offered in previous pneumatic outlets, they offer: easy and efficient clean-out without disassembly, an improved locking device for the end caps and easier operation. The Model 5015 Fluidized Butterfly Outlet is designed for controlled gravity discharge of fine bulk powders with fluidized assist. 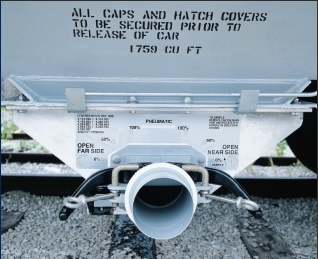 When unloaded through conventional gravity outlets, powdered ladings have a tendency to bridge and column inside the hopper car, requiring time-consuming sledging, vibration and probing. 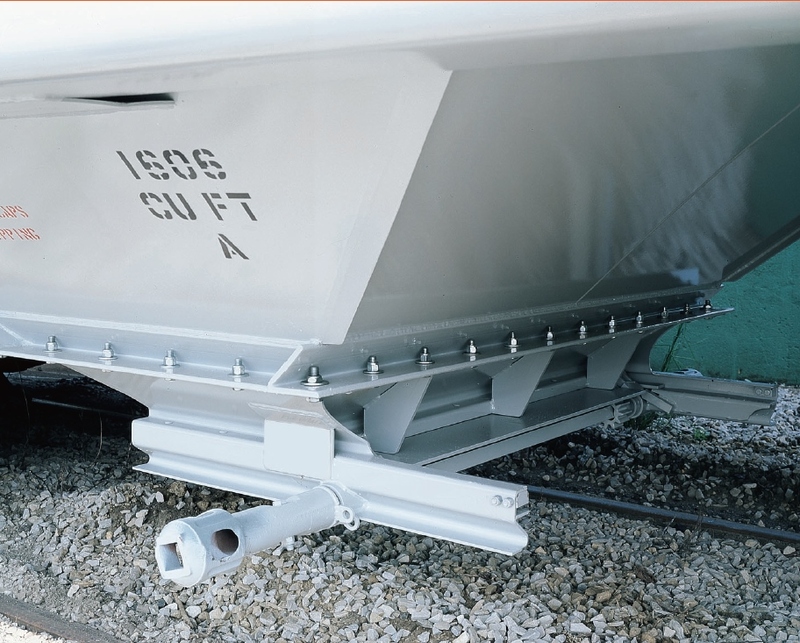 With the fluidized butterfly outlet, available on Center Flow® covered hopper cars, low pressure air is used to fluidize powdered ladings so that they flow as freely as liquids. Unloading is faster and more efficient. 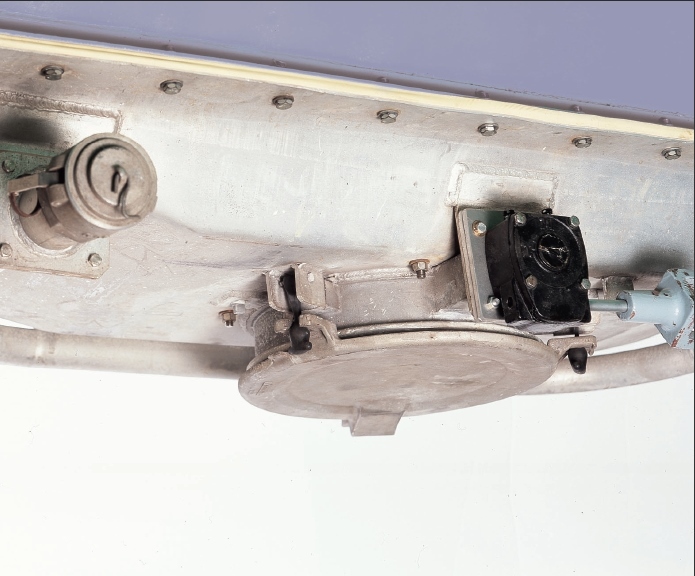 The outlet consists of shallow-sloped hoppers with a centrally located 16" cylindrical discharge port and a butterfly valve that controls the rate of flow. A special permeable membrane forms an air chamber between the slope sheets and the outlet’s outer shell. Low pressure air flowing through the membrane is injected into the area around the discharge opening, causing the lading to lose its internal strength and flow toward the outlet. The fluidizing membranes in the fluidized butterfly outlet are available in stainless steel, polypropylene or polyethylene, depending upon commodity requirements. The outlet is available with manual operating controls or may be equipped with a gear reduction system to lower operating torque. Maximum protection from contamination is achieved using an unloading boot attached directly to the discharge port. The boot can be applied with a boot lift system or manually. Sanitation is further assured due to the fact that only the sealed shaft of the operating handle extends outside the hopper. A sanitary shield protects against contamination during transit. 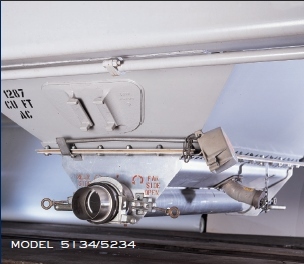 Fluidized Adjustable Pneumatic Outlet Models 5134/5234 are designed to quickly and easily unload the tough powders that tend to bridge and column during discharge. The system introduces low pressure air through the permeable stainless steel outlet slope sheets, fluidizing the lading so it flows freely to the outlet opening. The outlet also offers the flexibility of unloading free flowing materials without using fluidizing air. The model 5097 gravity outlet gate is specifically designed for fast, efficient, controlled discharge of a wide variety of dry bulk materials. The model 5097 outlet meets or exceeds all requirements of AAR standard S-233-92. The 5097 gravity outlet utilizes an automated locking device; long lasting, replaceable gate seals; reliable fixed capstan design; and allows the use of both manual and automated gate opening devices. The 5097 gravity outlet may be configured to fit a standard 32 bolt or 64 bolt Center Flow® mounting frame, and is designed to fit a 13" x 48" unloading boot or two (2) 13" x 24" unloading boots. 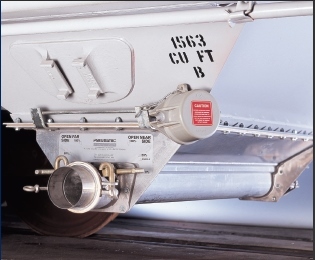 Meets or exceeds G.E.A.P.S./ A.A.R specifications S-233-92, for application of gravity outlet gates to new or rebuilt covered hopper cars. The Center Flow® Gravity-Pneumatic Outlet was designed to meet the demand for a combination outlet providing unobstructed gravity discharge and complete pneumatic flow. This outlet assures instant car versatility to meet varied unloading patterns. Yet, there is no compromise of efficiency to provide this flexibility...you get full flow with either type discharge. Conventional Gravity-Pneumatic outlets were at best compromises because of the obstructed gravity flow and inefficient pneumatic clean-out. Departing from the standard technique of placing a pneumatic intake hood and tube over the gravity slide gate, the pneumatic outlet is mounted completely outside the gravity discharge area. This design is at least five times more effective in preventing bridging of lading than other combination outlets. It provides between-rail unloading at rates as rapid as the straight gravity outlet. Location of the pneumatic intake beneath the gravity slide gate provides effective air control over the full length and width of the outlet. Result: you get maximum flow rate and full clean-out; not just with the more powerful systems but with almost any pneumatic unloading system. Adjustable Pneumatic Outlet Models 5131/5231 are designed to provide easy and complete clean-out without disassembly; optimum flow control for pellets and powders; easier operation because of reduced torque requirements; an improved locking device for the end caps; high-strength handles; and the provision for product sampling from either side of the outlet. Adjustable Pneumatic Outlet Model 5236 is designed to give superior performance with unparalleled sanitation. The 5236 outlet offers easy cleaning with removable adapters, a seamless clean bore design, a serrated control valve for greater flow control and easier operation, provisions for sampling without flooding the product tube, and an improved mounting gasket design.